Physical characteristics: The male Albert's lyrebird (also known as Prince Albert's lyrebird) is not as dramatic looking as the superb lyrebird, since its tail lacks the outer lyre-shaped tail feathers of its cousin. The Albert's species is slightly smaller than the superb as well, with adult females measuring 33 inches (84 centimeters) and adult males measuring 35.5 inches (90 centimeters). Both sexes have small heads, long tails, and long, powerful legs and claws. They are virtually flightless, although the birds use their weak, undeveloped wings to help them hop up and down from low branches and other perches, much like a chicken does. Albert's lyrebirds are deep chestnut on their upper bodies, with reddish buff throats. The males' tails are glossy black and silver-gray underneath. Both sexes are legendary for their ability to copy almost any sound, natural or mechanical. The male lyrebird's species-specific call is a piercing "craw-cree-craw-craw-wheat," and when alarmed both sexes emit a shrieking "whisk-whisk" cry. Geographic range: Occupying a smaller range than the superb lyrebird, the Albert's lyrebird is limited to mountainous rainforests between the Mistake Range in southeast Queensland to the Nightcap Range in northeast New South Wales. In all, the bird's territory totals only 580 square miles (1,500 square kilometers), which supports an estimated 3,500 individuals. The highest population densities of Albert's lyrebird have been found at Whian Whian State Forest in the Nightcap Range, but other significant populations exist in the Richmond, Tweed, and McPherson Ranges. Habitat: Found only in Australian rainforests at about 1,000 feet (300 meters) and above, Albert's lyrebird requires a dense understory that provides deep leaf litter for foraging. The Antarctic poplar is usually present in the lyrebird's environment as well. They bathe daily in still pools or slow-running streams. Diet: Lyrebirds rely on their strong claws and legs to scratch through leaf litter, fallen branches, and even rocks, uncovering spiders, worms, ants, frogs, lizards, grubs, and snails. Behavior and reproduction: In optimal conditions, Albert's lyrebirds prefer widely spaced territories, with about five pairs of birds per 0.4 square miles (1 square kilometer). They are sedentary birds, rarely leaving their own territory. Both sexes are shy and difficult to spot, and when threatened will dart and dodge quickly through the underbrush, giving out piercing calls of alarm. Because of their underdeveloped wings, the birds can run much faster than they can fly. Lyrebirds roost in the low branches of trees at night. During the mating season from May to August, males perform an elaborate and graceful dance atop a low platform of trampled vegetation or in an area of scratched earth. Each male may have as many as ten or fifteen of these display arenas, which he visits in turn. Their vocalizations during this time are complex and penetrating, consisting of a cycle of imitations of various natural and human-made sounds. Known as the "albertcycle," the song is often interspersed with territorial songs, after which the male bird will pause briefly to listen for an answering challenge. Following the pause, he will usually resume his cycle where he left off or he may start all over. Once the male attracts a female bird, he will fan his tail over his back and prance back and forth over his platform in a rhythmic, dignified manner. The male will mate with as many females as he can entice to his arena. After mating, the female builds a loosely constructed dome of sticks up several feet (about one meter) off the ground, lining and insulating it with her own feathers, moss, and ferns. 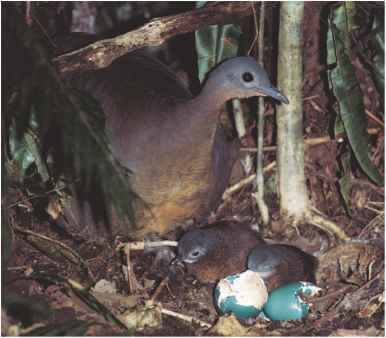 She lays one egg in a moist indentation in the center of the structure, incubating it alone and then tending to the nestling without assistance for up to nine months. The young develop slowly, remaining covered with down even at four months old. Albert's lyrebirds and people: Lyrebirds' extraordinary ability to mimic sounds has amused people for as long as the species have coexisted. One local story from the nineteenth century described how a lyrebird repeatedly caused the evacuation of a logging operation with its imitation of a fire siren until the loggers discovered the culprit. However, other encounters have not been so friendly. Many farmers and gardeners are annoyed by the lyrebirds' habit of shuffling through mulch and leaves, and some conservationists have even suggested that the birds are endangering other ground-dwelling animals and some types of vegetation with their large-scale digging. The bird's shy and elusive nature has thwarted many attempts to study it. Ford, H. A., and D. C. Paton, eds. The Dynamic Partnership: Birds and Plants in Southern Australia. South Australia: D. J. Woolman, 1986. Higgins, P. J., et al., eds. Handbook of Australian, New Zealand and Antarctic Birds. Vol. 5, Tyrant-Flycatchers to Chats. Melbourne: Oxford University Press, 2001. Rutgers, Abram. Birds of Australia. London: Methuen & Co., 1967. Schodde, R., and I. J. Mason. The Directory of Australian Birds—Passerines. Collingwood, Australia: CSIRO Publishing, 1999. Smith, L. H. The Life of the Lyrebird. Richmond, Australia: William Heinemann Australia, 1988. Curtis, H. S. "The Albert Lyrebird in Display." Emu 72 (1972): 81-84. Sibley, C. G. "The Relationship of the Lyrebirds." Emu 74 (1974): 65-79. "Albert's Lyrebird." ARKive: Images of Life on Earth. http://www. arkive.org/species/GES/birds/Menura_alberti/more_info.html (accessed on April 28, 2004). "Albert's Lyrebird." Birdlife.net. http://www.birdlife.net (accessed on April 28, 2004). "Lyrebird." Concise Britannica Online. http://concise.britannica.com (accessed on April 28, 2004). "Lyrebirds." Cornell University Department of Ecology and Evolutionary Biology. http://www.eeb.cornell.edu/winkler/botw/menuridae.html (accessed on April 28, 2004). "Lyrebirds." National Parks and Wildlife Service Australia. http://www. nationalparks.nsw.gov.au/npws.nsf/Content/Lyrebirds (accessed on April 28, 2004). "Lyrebird." Wikipedia. http://en.wikipedia.org/wiki/Lyrebird (accessed on April 28, 2004). 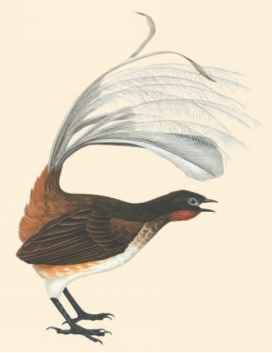 Both species of the ancient scrub-bird family, the noisy and the rufous, are 6.5 to 9 inches (16.5 to 23 centimeters) long. Male noisy scrub-birds typically weigh about 1.7 ounces (52 grams), while the smaller male rufous scrub-bird weighs somewhat less. Plainly colored in drab brown with black bars, the birds use their natural camouflage (KAM-uh-flaj) to hide themselves in dense underbrush. The rufous species is reddish brown on top with a buff belly, while the noisy scrub-bird is brown on top and reddish brown on the lower belly, fading to off-white on its breast. Males of both species have distinct black markings on their throats and breasts. Scrub-birds have strong, short legs and rounded, weak wings that render them semi-flightless. Otherwise they are generally stoutly built. Their flat, long foreheads taper to a triangular bill, and they tend to carry their longish tails at an upward angle. Juveniles look similar to adults, but with duller plumage. Both species of scrub-bird occur only in Australia and only within restricted ranges. The rufous species lives in isolated populations in the Queensland-New South Wales border area. The noisy scrub-bird occupies the far southwestern corner of the country in Two People's Bay Nature Reserve near Albany and, since they were reintroduced there in 1998, the Darling Range of Western Australia, outside the city of Perth. Scrub-birds require dense, low vegetation in which to hide from predators, animals that hunt them for food, and forage, phylum class subclass order monotypic order suborder family search, for food. They are adapted to a thick layer of leaf litter and a moist microclimate, a small, uniformly moist area. The rufous scrub-birds prefer temperate rainforest, whereas the noisy scrub-bird occupies semi-arid areas.